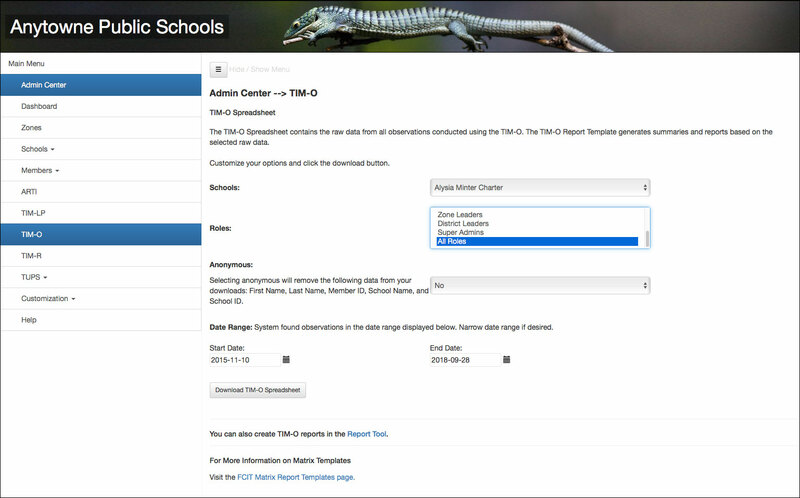 Members with roles that have “TIM-O: View and download data” enabled, will be able to download TIM-O data at their own administrative level using the Admin Center. 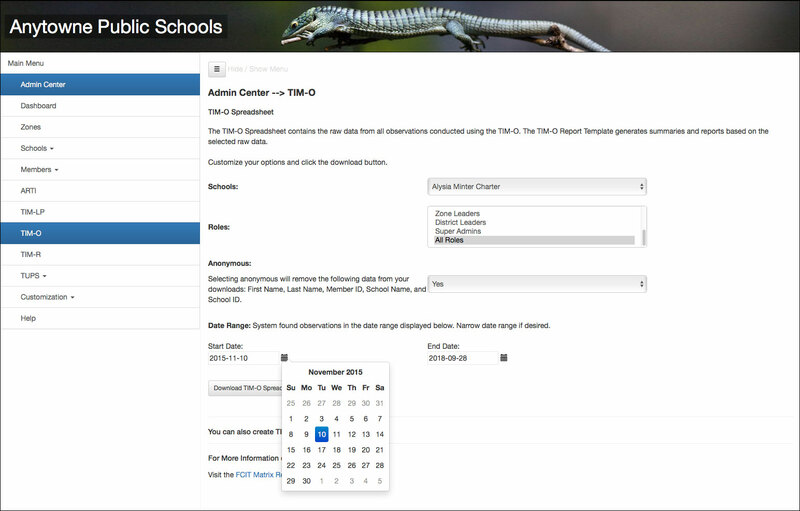 That is, school leaders will be able to download TIM-O from their assigned school, zone leaders will be able to download TIM-O from their assigned their assigned zone, and district leaders will be able to access all TIM-O data from across the district. Figure 1. Opening TIM-O screen. No values have been selected by the user, however the Start Date and End Date have been automatically populated indicating the range of existing data. 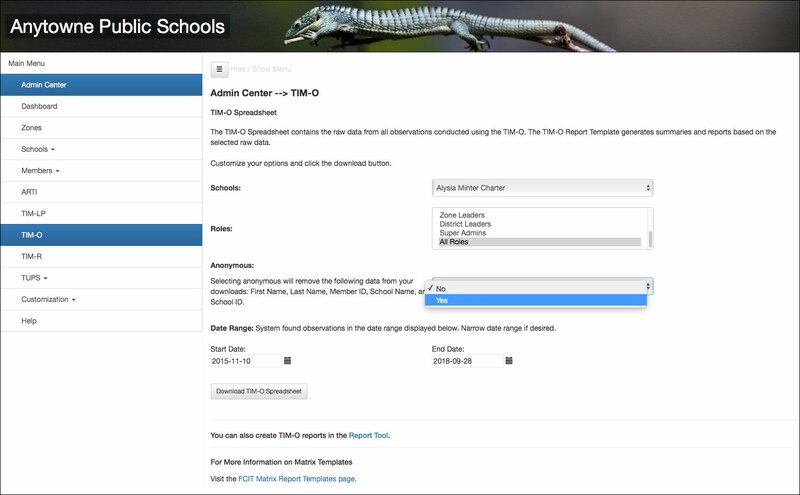 Users with district-level TIM-O data access will be able to select all schools in the district or any particular school. 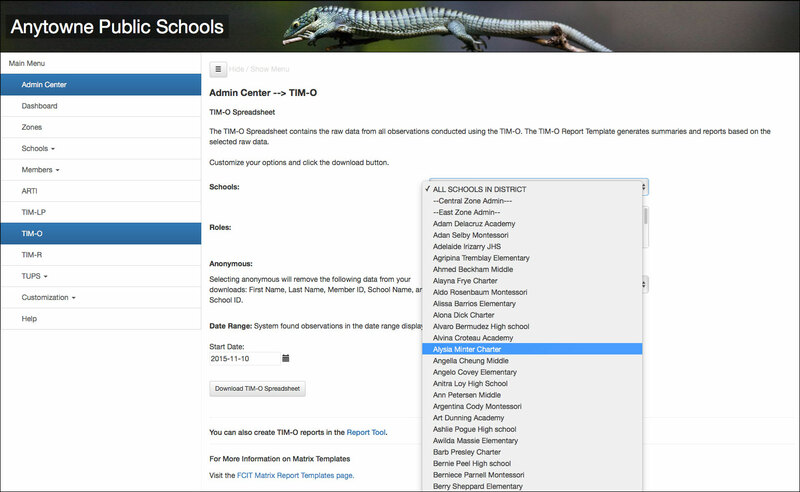 Users with zone-level TIM-O data access will be able to select all schools in the zone or any particular school within the zone. 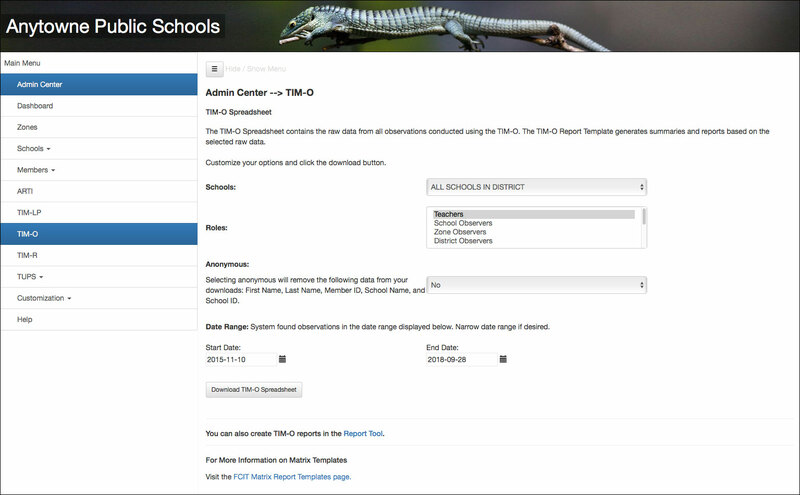 The school will be pre-selected for users with school-level TIM-O data access. Selecting Anonymous will remove the following data from your downloads: First Name, Last Name, Member ID, School Name, and School ID. There may be times when users wish to share data without identifying information. Note, however, that this selection simply removes the fields noted above. There still may be identifying information in the remaining fields such as the “Comments” column. Users must determine if eliminating these five fields meets their need for anonymized data. 5. Next select the Start Date and End Date. If you leave the default dates unchanged, you will receive a download of every TIM-O observation. You can change both the Start Date and End Date to narrow the range if desired. Click the calendar icon to change the date. 7. When your date range is set, click the Download TIM-O Spreadsheet button and the download will begin automatically. 8. TIM-O summary data is also available via the Report Tool.